This article is about the demographic features of the population of Turkey, including population density, ethnicity, education level, health of the populace, economic status, religious affiliations and other aspects of the population. In 2017, the population of Turkey was estimated to be 80.8 million with a growth rate of 1.24% per annum. The population is relatively young with 23.6% falling in the 0–14 age bracket. According to the OECD/World Bank population statistics, from 1990 to 2008 the population growth in Turkey was 16 million or 29%. Birth statistics of Turkey from 2001 onward are from The Central Population Administrative System (MERNIS) data base which is available on-line. Birth statistics are updated continually because MERNIS has dynamic structure. In 2010 Turkey had a crude birth rate of 17.2 per 1000, in 2011 16.7, down from 20.3 in 2001. The total fertility rate (TFR) in 2010 was 2.05 children per woman, in 2011 2.02. The crude birth rate in 2010 ranged from 11.5 in West Marmara (TFR 1.52) (11,5;1.55 in 2011), similar to Bulgaria, to 27.9 in Southeast Anatolia (TFR 3.53) (27.1;3,42 in 2011), similar to Syria. Similarly, in 2012, the TFR ranged from 1.43 in Kırklareli, to 4.39 in Şanlıurfa. Deaths statistics from MERNIS are available as of 2009. Mortality data prior to 2009 are incomplete. Total fertility rate by region in Turkey by Turkish General Census(GNS) and Turkish population and health research(TNSA). Bursa Province and Yalova Province were the provinces with foreign born population greater than 5% in 2014. This figure possibly excludes the Syrians with refugee status as 76413 were the Syria-born people. Turkey hosts nearly 3 million registered Refugees of the Syrian Civil War. People moving into Turkey during the Republican Period include Muslim refugees (Muhajir) from formerly Muslim-dominated, like Crimean Tatars, Algerian followers of Abd-el-Kader, Mahdists from Sudan, Turkmens, Kazakhs, Kyrgyz and other Central Asian Turkic-speaking peoples fleeing the USSR and later the war-torn Afghanistan, Balkan Muslims, either Turkish-speaking or Bosniaks, Bulgarian Muslims, Albanians, Greek Muslims etc., fleeing either the reborn majority-Christian states or later the Communist regimes, in Yugoslavia and Bulgaria for instance. Since the fall of the Iron Curtain, there has been a considerable influx of Eastern Europeans to Turkey, particularly from the former USSR. Some of them have chosen to become Turkish citizens, while others continue to live and work in Turkey as foreigners. The district of Laleli in Istanbul is known with the nickname "Little Russia" due to its large Russian community and the numerous street signs, restaurant names, shop names and hotel names in the Russian language. After a change in the Turkish constitution increased minorities' right to purchase real estate in the country in 2005, a large number of people, mostly pensioners from Western Europe, bought houses in the popular tourist destinations and moved to Turkey. The largest groups, according to the volume of purchases, are the Germans, British, Dutch, Irish, Italians and Americans. No exact data are available concerning the different ethnic groups in Turkey. The last census data according to language date from 1965 and major changes may have occurred since then. However, it is clear that the Turkish are in the majority, while the largest minority groups are Kurds and Arabs. Smaller minorities are the Armenians, Greeks. All ethnic groups are discussed below. The word Turk or Turkish also has a wider meaning in a historical context because, at times, especially in the past, it has been used to refer to all Muslim inhabitants of the Ottoman Empire irrespective of their ethnicity. The question of ethnicity in modern Turkey is a highly debated and difficult issue. Figures published in several different sources prove this difficulty by varying greatly. According to the 2016 edition of the CIA World Factbook, 70-75% of Turkey's population consists of ethnic Turks, with Kurds accounting for 19% and other minorities between 7 and 12%. According to Milliyet, a 2008 report prepared for the National Security Council of Turkey by academics of three Turkish universities in eastern Anatolia suggested that there are approximately 55 million ethnic Turks, 9.6 million Kurds, 3 million Zazas, 2.5 million Circassians, 2 million Bosniaks, 500,000-1.3 million Albanians, 1,000,000 Georgians, 870,000 Arabs, 600,000, Pomaks, 80,000 Laz, 60,000 Armenians, 25,000 Assyrians/Syriacs, 20,000 Jews, and 15,000 Greeks, 500 Yazidis living in Turkey. Since the immigration to the big cities in the west of Turkey, interethnic marriage has become more common. A recent study estimates that there are 2,708,000 marriages between Turks and Kurds. 0 (International): "The language is widely used between nations in trade, knowledge exchange, and international policy." 1 (National): "The language is used in education, work, mass media, and government at the national level." 2 (Provincial): "The language is used in education, work, mass media, and government within major administrative subdivisions of a nation." 3 (Wider Communication): "The language is used in work and mass media without official status to transcend language differences across a region." 4 (Educational): "The language is in vigorous use, with standardization and literature being sustained through a widespread system of institutionally supported education." 5 (Developing): "The language is in vigorous use, with literature in a standardized form being used by some though this is not yet widespread or sustainable." 6a (Vigorous): "The language is used for face-to-face communication by all generations and the situation is sustainable." 6b (Threatened): "The language is used for face-to-face communication within all generations, but it is losing users." 7 (Shifting): "The child-bearing generation can use the language among themselves, but it is not being transmitted to children." 8a (Moribund): "The only remaining active users of the language are members of the grandparent generation and older." 8b (Nearly Extinct): "The only remaining users of the language are members of the grandparent generation or older who have little opportunity to use the language." 9 (Dormant): "The language serves as a reminder of heritage identity for an ethnic community, but no one has more than symbolic proficiency." 10 (Extinct): "The language is no longer used and no one retains a sense of ethnic identity associated with the language." Turkish women and a school boy from Istanbul, 1873. Although numerous modern genetic studies have indicated that the present-day Turkish population is primarily descended from historical Anatolian groups, the first Turkic-speaking people lived in a region extending from Central Asia to Siberia and were palpable after the 6th century BC. Seventh-century Chinese sources preserve the origins of the Turks stating that they were a branch of the Hsiung-nu (Huns) and living near the "West Sea", perhaps the Caspian Sea. Modern sources tends to indicate that the Turks' ancestors lived within the state of the Hsiung-nu in the Transbaikal area and that they later, during the fifth century, migrated to the southern Altay. 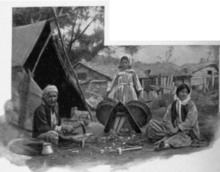 The word Türk was used only referring to Anatolian villagers back in the 19th century. The Ottoman elite identified themselves as Ottomans, not usually as Turks. In the late 19th century, as European ideas of nationalism were adopted by the Ottoman elite, and as it became clear that the Turkish-speakers of Anatolia were the most loyal supporters of Ottoman rule, the term Türk took on a much more positive connotation. During Ottoman times, the millet system defined communities on a religious basis, and a residue of this remains in that Turkish villagers will commonly consider as Turks only those who profess the Sunni faith, and will consider Turkish-speaking Jews, Christians, or even Alevis to be non-Turks. On the other hand, Kurdish-speaking or Arabic-speaking Sunnis of eastern Anatolia are sometimes considered to be Turks. The imprecision of the appellation Türk can also be seen with other ethnic names, such as Kürt(Kurd), which is often applied by western Anatolians to anyone east of Adana, even those who speak only Turkish. Thus, the category Türk, like other ethnic categories popularly used in Turkey, does not have a uniform usage. In recent years, centrist Turkish politicians have attempted to redefine this category in a more multi-cultural way, emphasizing that a Türk is anyone who is a citizen of the Republic of Turkey. Currently, article 66 of the Turkish Constitution defines a "Turk" as anyone who is "bound to the Turkish state through the bond of citizenship". Ethnic Turks are the majority in Turkey, numbering 55.5 to 60 million. The Kurdish identity remains the strongest of the many minorities in modern Turkey. This is perhaps due to the mountainous terrain of the southeast of the country, where they predominate and represent a majority. They inhabit all major towns and cities across Turkey, however. No accurate up-to-date figures are available for the Kurdish population, because the Turkish government has outlawed ethnic or racial censuses. An estimate by the CIA World Factbook places their proportion of the population at approximately 19%. Another estimate, according to Ibrahim Sirkeci, an ethnic Turk, in his book The Environment of Insecurity in Turkey and the Emigration of Turkish Kurds to Germany, based on the 1990 Turkish Census and 1993 Turkish Demographic Health Survey, is 17.8%. Other estimates include 15.7% of the population according to the newspaper Milliyet, and 23% by Kurdologist David McDowall. Kurdish national identity is far from being limited to the Kurmanji-language community, as many Kurds whose parents migrated towards Istanbul or other large non-Kurdish cities mostly speak Turkish, which is one of the languages used by the Kurdish nationalist publications. The population of Arabs in Turkey varies according to different sources. Al Jazeera and the Washington Institute for Near East Policy estimates the Arab population before the Syrian Civil War in 2011 from 1,500,000 to more than 2,000,000, with recent Syrian refugees 2,748,367, so Arabs in Turkey constituency now numbers anywhere from 4.5 to 5.1% of the population. Put another way, with nearly 4-5 million Arab inhabitants. Armenians in Turkey are indigenous to Anatolia & Armenian highlands well over 3000 years, an estimated population of 40,000 (1995) to 70,000. Most are concentrated around Istanbul. The Armenians support their own newspapers and schools. The majority belong to the Armenian Apostolic faith, with smaller numbers of Armenian Catholics and Armenian Evangelicals. Their original population during the dying days of the Ottoman Empire was estimated in excess of 3 million, from 1915 to early 1920's it is estimated that over 1.5 Million of them perished during the Armenian Genocide and forced relocations into the Syrian desert. An estimated 40,000-50,000 Assyrians/Syriacs live in Turkey, with about 17,000 in Istanbul and the other 23-33,000 scattered in southeast Turkey primarily in Turabdin, Diyarbakir, Adiyaman, and Harput respectively. They belong to the Syriac Orthodox Church, Syriac Catholic Church, and Chaldean Catholic Church. Some Mhallami, a Muslim ethnic group who usually are described as Arabs, have Assyrian/Syriac ancestry. They live in the area between Mardin and Midyat, called in Syriac "I Mhalmayto" (ܗܝ ܡܚܠܡܝܬܐ). It is difficult to determine how many ethnic Azeris currently reside in Turkey, as ethnicity is a rather fluid concept in Turkey, especially amongst Turkic-speaking and Caucasian groups who have been more readily and easily assimilated into mainstream Turkish culture. According to the Looklex Encyclopaedia, Azerbaijani people make up 800,000 of Turkey's population. Up to 300,000 of Azeris who reside in Turkey are citizens of Azerbaijan. In the Eastern Anatolia Region, Azeris are sometimes referred to as acem (see Ajam) or tat. They currently are the largest ethnic group in the city of Iğdır and second largest ethnic group in Kars. Towards the end of the Caucasian War (1817–1864), many Chechens fled their homelands in the North Caucasus and settled in the Ottoman Empire. Chechens number from tens or hundreds of thousands. Towards the end of the Russo-Circassian War (1763–1864), many Circassians fled their homelands in the North Caucasus and settled in the Ottoman Empire. Most ethnic Circassians have fully assimilated into Turkish culture, making it difficult to trace, count, or even estimate their ethnic presence. There are approximately 1 million people of Georgian ancestry in Turkey, according to the newspaper Milliyet. The Greeks constitute a population of Greek and Greek-speaking Eastern Orthodox Christians who mostly live in Istanbul, including its district Princes' Islands, as well as on the two islands of the western entrance to the Dardanelles: Imbros and Tenedos (Turkish: Gökçeada and Bozcaada), and historically also in western Asia Minor (centred on Izmir/Smyrni), the Pontic Alps (centred on Trebzon and Sumelia, see Pontic Greeks), and central Anatolia (Cappadocia) and northeastern Anatolia and the South Caucasus region (Erzinjan, Erzerum, Kars, and Ardahan, see Caucasus Greeks). The Istanbul Greeks are the remnants of the estimated 200,000 Greeks permitted under the provisions of the Treaty of Lausanne (1923) to remain in Turkey following the 1923 population exchange, which involved the forcible resettlement of approximately 1.5 million Greeks from Anatolia and East Thrace and of half a million Turks from all of Greece except for Western Thrace. After years of persecution (e.g. the Varlık Vergisi (1942–1944) and the Istanbul Pogrom of 1955), emigration of ethnic Greeks from the Istanbul region greatly accelerated, reducing the 120,000-strong Greek minority to about 7,000 by 1978. The 2008 figures released by the Turkish Foreign Ministry places the current number of Turkish citizens of Greek descent at the 2,000–3,000 mark. According to Milliyet there are 15,000 Greeks in Turkey, while according to Human Rights Watch the Greek population in Turkey was estimated at 2,500 in 2006. Shireen Hunter noted in a 2010 publication that there were some 500,000 Iranians in Turkey. Most Laz today live in Turkey, but the Laz minority group has no official status in Turkey. Their number today is estimated to be around 250,000 and 500,000. Only a minority are bilingual in Turkish and their native Laz language which belongs to the South Caucasian group. The number of the Laz speakers is decreasing and is now limited chiefly to the Rize and Artvin areas. The historical term Lazistan — formerly referring to a narrow tract of land along the Black Sea inhabited by the Laz as well as by several other ethnic groups — has been banned from official use and replaced with Doğu Karadeniz (which includes Trabzon). During the Russo-Turkish War of 1877–1878, the Muslim population of Russia near the war zones was subjected to ethnic cleansing; many Lazes living in Batum fled to the Ottoman Empire, settling along the southern Black Sea coast to the east of Samsun. The Roma in Turkey descend from the times of the Byzantine Empire. According to some reports, there are about 500,000-700,000 Roma in Turkey. The neighborhood of Sulukule, located in Western Istanbul, is the oldest Roma settlement in Europe. The Zazas are a people in eastern Anatolia who natively speak the Zaza language. Their heartland, the Dersim region, consists of Tunceli, Bingöl provinces and parts of Elazığ, Erzincan and Diyarbakır provinces. The exact number of Zazas is unknown, due to the absence of recent and extensive census data. The most recent official statistics concerning native language are available for the year 1965, where 147,707 (0.5%) chose Zaza as their native language in Turkey. According to the latest sources by Ipsos, in 2016 Islam was the major religion in Turkey comprising 82% of the total population, followed by religiously naffiliated people, comprising 13% of the population, and Christians, forming 2%. There are no official statistics of people's religious beliefs nor is it asked in the census. According to the government, 99.8% of the Turkish population is Muslim, mostly Sunni, some 10 to 15 million are Alevis. The remaining 0.2% is other - mostly Christians and Jews. However, these are based on the existing religion information written on every citizen's national id card, that is automatically passed on from the parents to every newborn, and do not necessarily represent individual choice. Furthermore, anyone who was not officially registered as Christian or Jewish by the time of the foundation of the republic was automatically recorded as Muslim, and this label has been passed down to new generations. Therefore, the official number of Muslims also include people with no religion; converted from Islam to a different religion than Islam; and anyone who is of a different religion than their parents but hasn't applied for a change of their individual records. It should also be noted that the state allows the individual records to be changed and can have their religion information removed from the identification card, but such change doesn't affect the official record. The Eurobarometer Poll 2005 reported that in a poll 96% of Turkish citizens answered that "they believe there is a God", while 1% responded that "they do not believe there is any sort of spirit, God, or life force". In a Pew Research Center survey, 53% of Turkey's Muslims said that "religion is very important in their lives". Based on the Gallup Poll 2006–08, Turkey was defined as More religious, in which over 63 percent of people believe religion is important. According to the Turkish Economic and Social Studies Foundation, 33% of women wear the headscarf or hijab in Turkey however most of them wear a cultural headscarf which is not a symbol of Islam and is used by women in small villages that work under the sun to protect themselves from the sun. 18% of male Muslim citizens regularly attend Friday prayers. A poll conducted by Eurobarometer, KONDA and some other research institutes in 2013 showed that around 4.5 million of the 15+ population had no religion. Another poll conducted by the same institutions in 2015 showed that that number has reached 5.5 million, which makes roughly 9.4% of the population. 34.3 % defined themselves as "a believer who does not fulfill religious obligations" (Not religious). 9.7% defined themselves as "a fully devout person fulfilling all religious obligations" (Fully devout). 2.3% defined themselves as "someone who does not believe in religious obligations" (Non-believer). 0.9% defined themselves as "someone with no religious conviction" (Atheist). Modern Turkey was founded by Mustafa Kemal Atatürk as secular (Laiklik, Turkish adaptation of French Laïcité), i.e. without a state religion, or separate ethnic divisions/ identities. The concept of "minorities" has only been accepted by the Republic of Turkey as defined by the Treaty of Lausanne (1923) and thence strictly limited to Greeks, Jews and Armenians, only on religious matters, excluding from the scope of the concept the ethnic identities of these minorities as of others such as the Kurds who make up 15% of the country; others include Assyrians/Syriacs of various Christian denominations, Alevis and all the others. There are many reports from sources such as (Human Rights Watch, European Parliament, European Commission, national parliaments in EU member states, Amnesty International etc.) on persistent yet declining discrimination. Non-Muslim minority numbers are said to be falling rapidly, mainly as a result of aging, migration (to Israel, Greece, the United States and Western Europe). There is concern over the future of the Greek Orthodox Patriarchate, which suffers from a lack of trained clergy due to the closure of the Halki school. The state does not recognise the Ecumenical status of the Patriarch of Constantinople. According to figures released by the Foreign Ministry in December 2008, there are 89,000 Turkish citizens designated as belonging to a minority, two thirds of Armenian descent. ^ a b "Turkish Statistical Institute". Turkstat.gov.tr. 2018-02-01. Retrieved 2018-04-09. ^ "Population Statistics And Projections". Turkstat.gov.tr. Retrieved 2014-06-17. ^ "Census of Population ; Social and Economic Characteristics of Population, Turkey". Turkstat.gov.tr. Retrieved 2016-04-15. ^ "World Population Prospects - Population Division - United Nations". Retrieved 2017-07-16. ^ "World Population Prospects: The 2017 Revision". Esa.un.org. 2018-10-08. ^ "::Welcome to Turkish Statistical Institute(TurkStat)'s Web Pages::". TurkStat. Retrieved 2014-06-17. ^ "Turkish Statistical Institute". Turkstat.gov.tr. Retrieved 2014-06-17. ^ Turkish Statistical Institute (TurkStat) (2012-08-31). "Turkish Statistical Institute Birth Statistics 2012". Turkstat.gov.tr. Retrieved 2014-06-17. ^ "The DHS Program - Quality information to plan, monitor and improve population, health, and nutrition programs". Dhsprogram.com. Retrieved 8 November 2017. ^ a b "Spatial Distribution of Total Fertility Rate in Turkey" (PDF). Ankara University. 2004. Retrieved 2016-05-16. ^ a b c d e f "TurkStat". TurkStat. 2013. Retrieved 2015-03-22. ^ "İllerin aldığı, verdiği göç, net göç ve net göç hızı, 1980-2016". Tuik.gov.ty. Retrieved 8 November 2017. ^ (TurkStat), Turkish Statistical Institute. "Turkish Statistical Institute The Results of Address Based Population Registration System 2015". Turkstat.gov.tr. Retrieved 8 November 2017. ^ "İllerin aldığı, verdiği göç, net göç ve net göç hızı, 1980-2016". Turkstat.gov.tr. Retrieved 8 November 2017. ^ "Yaş grubu ve cinsiyete göre il/ilçe merkezi ve belde/köy nüfusu, 2007-2016". Turkstat.gov.tr. Retrieved 8 November 2017. ^ "..::Welcome to Turkish Statistical Institute(TurkStat)'s Web Pages::." Turkstat.gov.tr. Retrieved 8 November 2017. ^ "Middle East :: TURKEY". CIA The World Factbook. ^ a b c "UN Demographic Yearbooks". Unstats.un.org. Retrieved 2014-06-17. ^ Icduygu, A., Toktas, S., & Soner, B. A. (2008). The politics of population in a nation-building process: Emigration of non-muslims from turkey. Ethnic and Racial Studies, 31(2), 358-389. ^ American Heritage Dictionary (2000). "The American Heritage Dictionary of the English Language: Fourth Edition - "Turk"". Houghton Mifflin Company. Archived from the original on 2007-01-16. Retrieved 2006-12-27. ^ Joshua Project. "Zaza-Dimli in Turkey". Joshua Project. Retrieved 2014-06-17. ^ a b c d e "Türkiyedeki Kürtlerin Sayısı!". Milliyet (in Turkish). 2008-06-06. Retrieved 2008-06-07. ^ "Turquie: situation générale". Axl.cefan.ulaval.ca. Retrieved 8 November 2017. ^ Yardumian, A.; Yardumian, T. G. (2011). "Who Are the Anatolian Turks?". Anthropology & Archeology of Eurasia. 50: 6–42. doi:10.2753/AAE1061-1959500101. ^ Hodoğlugil, U. U.; Mahley, R. W. (2012). "Turkish Population Structure and Genetic Ancestry Reveal Relatedness among Eurasian Populations". Annals of Human Genetics. 76 (2): 128–141. doi:10.1111/j.1469-1809.2011.00701.x. PMC 4904778. PMID 22332727. ^ Arnaiz-Villena, A.; Karin, M.; Bendikuze, N.; Gomez-Casado, E.; Moscoso, J.; Silvera, C.; Oguz, F. S.; Sarper Diler, A.; De Pacho, A.; Allende, L.; Guillen, J.; Martinez Laso, J. (2001). "HLA alleles and haplotypes in the Turkish population: Relatedness to Kurds, Armenians and other Mediterraneans". Tissue Antigens. 57 (4): 308–317. doi:10.1034/j.1399-0039.2001.057004308.x. PMID 11380939. ^ Wells, R. S.; Yuldasheva, N.; Ruzibakiev, R.; Underhill, P. A.; Evseeva, I.; Blue-Smith, J.; Jin, L.; Su, B.; Pitchappan, R.; Shanmugalakshmi, S.; Balakrishnan, K.; Read, M.; Pearson, N. M.; Zerjal, T.; Webster, M. T.; Zholoshvili, I.; Jamarjashvili, E.; Gambarov, S.; Nikbin, B.; Dostiev, A.; Aknazarov, O.; Zalloua, P.; Tsoy, I.; Kitaev, M.; Mirrakhimov, M.; Chariev, A.; Bodmer, W. F. (2001). "The Eurasian Heartland: A continental perspective on Y-chromosome diversity". Proceedings of the National Academy of Sciences. 98 (18): 10244–10249. doi:10.1073/pnas.171305098. PMC 56946. PMID 11526236. ^ Milliyet. "55 milyon kişi 'etnik olarak' Türk". Retrieved 2011-07-21. ^ Library of Congress – Federal Research Division. "Country Profile: Turkey" (PDF). Retrieved 2010-02-06. ^ CIA. "The World Factbook". Retrieved 2011-07-27. ^ "Kürt Meselesi̇ni̇ Yeni̇den Düşünmek" (PDF). KONDA. July 2010. pp. 19–20. Retrieved 2013-06-11. ^ a b c "CIA World Factbook". CIA. 2018. Retrieved 2019-04-08. ^ Sirkeci, Ibrahim (2006). The Environment of Insecurity in Turkey and the Emigration of Turkish Kurds to Germany. New York: Edwin Mellen Press. pp. 117–118. ISBN 978-0-7734-5739-3. Retrieved 2006-08-11. ^ David McDowall. A Modern History of the Kurds. Third Edition. I.B.Tauris, May 14, 2004 - 504 pages, page 3. ^ "Turkey - Kurds". countrystudies.us. ^ "Turkey - Arabs". countrystudies.us. ^ a b "Turkey's demographic challenge". Aljazeera.com. Retrieved 2016-12-18. ^ "UNHCR Syria Regional Refugee Response/ Turkey". UNHCR. 31 December 2015. Retrieved 17 January 2016. ^ Ibrahim, KAYA, (8 November 2017). "The Iraqi Refugee Crisis and Turkey: a Legal Outlook". Cadmus.eui.eu. Retrieved 8 November 2017. ^ "The Impact of Syrian Refugees on Turkey". Washingtoninstitute.org. Retrieved 2016-12-18. ^ Turay, Anna. "Tarihte Ermeniler". Bolsohays.com. Retrieved 2007-01-04. ^ Hür, Ayşe (2008-08-31). "Türk Ermenisiz, Ermeni Türksüz olmaz!". Taraf (in Turkish). Archived from the original on 2008-09-02. Retrieved 2008-09-02. Sonunda nüfuslarını 70 bine indirmeyi başardık. ^ "Turkey-Peoples". Looklex Encyclopaedia. Retrieved 13 August 2013. ^ "DomRaider - Decentralized Blockchain Auction". DomRaider / ICO. Retrieved 8 November 2017. ^ "Η μειονότητα των Ορθόδοξων Χριστιανών στις επίσημες στατιστικές της σύγχρονης Τουρκίας και στον αστικό χώρο". Demography-lab.prd.uth.gr. Retrieved 2014-06-17. 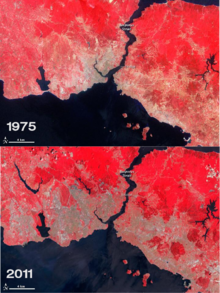 ^ Kilic, Ecevit (2008-09-07). "Sermaye nasıl el değiştirdi?". Sabah (in Turkish). Retrieved 2008-12-25. 6-7 Eylül olaylarından önce İstanbul'da 135 bin Rum yaşıyordu. Sonrasında bu sayı 70 bine düştü. 1978'e gelindiğinde bu rakam 7 bindi. ^ "Foreign Ministry: 89,000 minorities live in Turkey". Today's Zaman. 2008-12-15. Archived from the original on 2010-05-01. Retrieved 2008-12-15. ^ Hunter, Shireen (2010). Iran's Foreign Policy in the Post-Soviet Era: Resisting the New International Order. ABC-CLIO. p. 160. ISBN 9780313381942. ^ Margaret MacMillan. The Uses and Abuses of History. Retrieved 2014-06-17. ^ "僕が突き進む道はこれだ！人生山あり谷ありのものでも僕はめげないとキメた日は今日という日になります。 – 人生は楽しい。". Lightningturkish.com. Archived from the original on 7 June 2011. Retrieved 8 November 2017. ^ "ecoi.net". ecoi.net. Retrieved 2014-06-17. ^ "Turkey - General Information". Usefoundation.org. Archived from the original on 2014-05-27. Retrieved 2014-06-17. ^ United Nations High Commissioner for Refugees (2005-07-22). "Refworld | Roma rights organizations work to ease prejudice in Turkey". Unhcr.org. Retrieved 2014-06-17. ^ "Roma Rights Organizations Work to Ease Prejudice in Turkey". EurasiaNet.org. 2005-07-21. Retrieved 2014-06-17. ^ "AMONG SOCIAL KURDISH GROUPS – GENERAL GLANCE AT ZAZAS". Zazaki.net. Retrieved 8 November 2017. ^ "Malmisanıj - Kırd, Kırmanc, Dımıli veya Zaza Kürtleri". ^ "Religion, Ipsos Global Trends". Ipsos. 2017. Retrieved 19 August 2017. ^ a b Shankland, David (2003). The Alevis in Turkey: The Emergence of a Secular Islamic Tradition. Routledge (UK). ISBN 0-7007-1606-8. ^ "Eurobarometer on Social Values, Science and technology 2005" (PDF). Eurobarometer. Archived from the original (PDF) on 2006-05-24. Retrieved 2007-12-18. ^ Richard Wike; Juliana Menasce Horowitz. "Lebanon's Muslims: Relatively Secular and Pro-Christian". Pew Global Attitudes Project. ^ "2009 Gallup poll Gallup Poll". Gallup.com. Retrieved 2014-06-17. ^ Lamb, Christina (2007-04-23). "Head scarves to topple secular Turkey?". The Times. London. ^ Lamb, Christina (2007-05-06). "Headscarf war threatens to split Turkey". Times Online. London. ^ Clark-Flory, Tracy (2007-04-23). "Head scarves to topple secular Turkey?". Salon.com. Retrieved 2008-08-04. ^ "Türkiye'deki Ateist Nüfus Hızla Artıyor". Onedio.com. Retrieved 8 November 2017. ^ Religious Freedom Report U.S. Department of State. Retrieved on 2009-09-15. ^ KONDA Research and Consultancy (2007-09-08). "Religion, Secularism and the Veil in daily life" (PDF). Milliyet. Archived from the original (PDF) on 2009-03-25. ^ "1927 yılı Genel Nüfus Sayımı Sonuçları". Wowturkey.com. 1927-10-28. Retrieved 2014-06-17. ^ a b c d e All data taken from Turkish Statistical Institute (TurkStat). Data is for xxxx-12-31. Wikimedia Commons has media related to Demographics of Turkey.